IWC opens its first flagship boutique in New York.In 2012, at the end of April in New York opened its first flagship boutique known watch brand IWC. 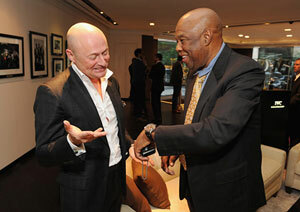 In 2012, at the end of April in New York opened its first flagship boutique known watch brand IWC. Was organized by the brilliant presentation with the participation of many celebrities, but the highlight of the event was the release of exclusive watches in honor of the greatest boxers of our time Muhammad Ali. The territory of the boutique in 3000 square meters located at the crossroads of north-eastern corner of Madison Avenue and 54th Street. The red ribbon was cut by IWC CEO Georges Kern, with the participation of the company branch manager in North America, Gianfranco D’Attissa and a number of celebrities – popular actor Matthew Fox, a former boxer Larry Holmes and Evander Holyfield, the star of “True Blood” Joe Manganiello, actor Chris Hemsworth and supermodel Adriana Lima. The event attracted the attention of not only the star guests, but the new clock Big Pilot’s Watch Edition Muhammad Ali, released in honor of the collaboration of IWC and the charitable foundation Muhammad Ali Foundation. A unique new product created in limited quantities – only 250 copies and will be available exclusively on the U.S. market. The interior of the new boutique is made in the style typical of the IWC. 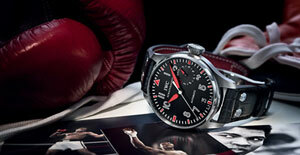 Every twist in store for the visitor opens a new and wonderful world of watches IWC. Front space like a boutique designed two-storey living room, complemented by full storefronts on both sides and an extensive 70-foot built-in lacquered bookcase with a large hanging origami – the boat in the center, which is reminiscent of the successful voyages of IWC. The whole room is equipped with a small great places for rest and numerous book shelves with books about sailing, boating and regattas. On the contrary cabinet display products, confirming the participation of the Italian shoemaker Santoni in the manufacture of straps for watches IWC. Outside the room, the visitor enters the “pilot’s” room, which hang from the ceiling large model aircraft, and simulator for those who want to try their hand at flying. A mannequin adorns the wall of the pilot room, but rather on the shelves and tables neatly stacked pilot’s jackets and other accessories. Directly in front of the living room into a transparent container filled with water submerged diver’s watch brand. And on the second floor of the boutique is a rest room, which is exhibited on the walls of an exclusive exhibition of photographs from the book GOAT-Greatest of All Time, on the life of Muhammad Ali. But watch Muhammad Ali, as expected, are based on the pilot model 1940 release, which are characterized by matte black dial and the index of the arrow in the 12 o’clock position. Time indexes and hands coated with luminous material Super-LumiNova bright red, in honor of Ali, who often wore red boxing gloves. The inner side of a black alligator strap is also painted red. On the back cover is engraved with the official logo of the model Muhammad Ali’s 70th birthday. A month later, an exclusive new product will be put up for auction and all proceeds will go to the Muhammad Ali Center, and the portion of the proceeds from sales will be used to support athletes for charitable purposes.